Direct from the We Could Have Told You That department, a recent study determined that introducing young boys to video games has a direct effect on their academic performance. Introducing a major distraction interferes with learning? Who'd have thought? The study conducted by Robert Weis, a psychologist at Ohio's Denison University, is the first controlled trial to look at the effect of playing video games on learning. While previous studies have reported on the effects of video games on academic performance using survey data of children's gaming habits, this one goes about things slightly differently. The researchers found 64 boys aged six through nine who had never owned a video game system, which sounds like a science award-winning feat if I've ever heard one. The study was presented (quite brilliantly) to parents as one monitoring child development, with a PlayStation 2 offered as a reward for participating. Half of the 64 children participating received the game system at the onset of the study, while the other half - the control group - received it at the end of the four-month program. 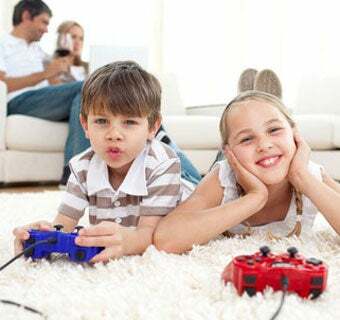 Needless to say, the children who suddenly found themselves in possession of video game entertainment spent more time playing games and less time studying and participating in extra-curricular activities. This makes perfect sense, for as Weis points out, the time spent playing video games replaces the time spent doing other things. Teachers reported delays in learning academic skills among the game-playing children, while tests conducted by the researchers showed less academic advancement overall when compared to the control group. While the results were almost predetermined, it is interesting to see the correlation at work. So kudos to Weis and his team, for not only providing such enlightening results, but also for conducting an unbiased study that didn't set out to vilify our hobby. "There's nothing evil about video games per se," said Weis, "It's just that we need to monitor kids' usage of these games and to urge moderation in the amount that kids play these games." Note that girls were not included in the study, as researchers were worried they would not play video games as much as the boys. I suggest a new study is in order.